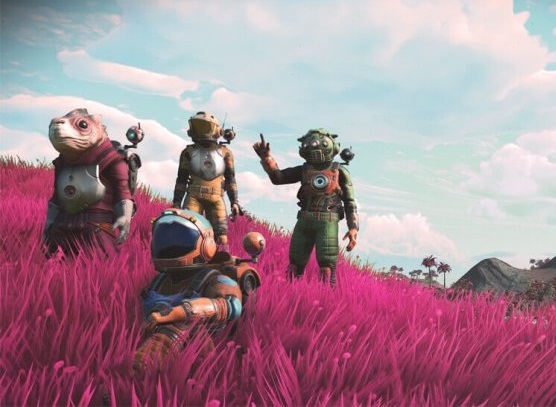 Home > Opinion > Game developers need to stop listening to "fans"
Game developers need to stop listening to "fans"
Over the last week we've seen a lot of stuff in the press regarding the launch of No Man's Sky NEXT; a massive, near re-release of a game that was first released back in 2016 amongst a hailstorm of virulent criticism. Some of the stories coming from Hello Games' lead, Sean Murray, regarding the "feedback" the team received, are nothing short of horrific. For context, No Man's Sky was pitched as an infinite space exploration and survival game. Procedurally generated, it aimed to provide players with billions of planets to explore on their journey to the centre of the universe. It actually delivered that. In my review of the game, I mentioned how much I loved it for the lonely existentialist thought that it encouraged. To me, No Man's Sky had a truly unique tone, different to what we'd seen in any other game set in space, and that tone was in part created through the "nothingness" of the gameplay. You were a lonely wanderer that didn't have much to do beyond mining for the resources that you needed to push on to the next planet. That was clearly deliberate. No Man's Sky wasn't trying to be "just another space game," with action and shootybangs and multiplayer heroics. It was trying to be a video game equivalent of Samuel Beckett's Waiting for Godot or one of Jean-Paul Sartre's novels. No Man's Sky was also never going to be as popular or mainstream as Mass Effect or Halo because of that theme. Just as the number of people who have read, much less seen a performance of Waiting for Godot is dwarfed by the more popular theatre plays (let alone cinema), the number of people that No Man's Sky would appeal to would be limited to the kind of people that like their games a bit artsy and reflective. Unfortunately, a series of PR bungles from both Hello Games and Sony (the publisher) led people to believe that No Man's Sky would be something mainstream. Then they started to play, realised that it was a weird experiment of a game, and collectively spat the dummy. I'm not going to get drawn into the years-long debate about whether Sean Murray "lied" about No Man's Sky (apparently that was justification enough to send him and his team death threats). What I will say is that people expected multiplayer and a far more detailed single player game than what they got, and PR is absolutely to blame for that. PR's job is to make sure people know what to expect from a game so they're not disappointed. In other words, I don't hold it against players for being disappointed with their experience with No Man's Sky (so long as they weren't one of those who then abused and harassed the developers). They clearly expected something different to what they got, and I don't think that's fair on them. The game should have been left in its original state. Yes, it disappointed some people, and I'm sure made plenty swear off ever buying a Hello Games game again. But the developer should have stuck to its vision, and the consumers should have let it. Subsequent updates to No Man's Sky, as well as the features promised in NEXT, have significantly diluted the message, theme, and aesthetics of the original game, and now it has morphed into just another space game. It doesn't really tell us anything, any more, because it's too busy trying to be "fun." Here's the great secret with art that people tend to forget about when it comes to games: You, as the audience, don't have to like everything. In fact, if you do like everything, that means that everything has been homogenised to the point where it can no longer be art; it has morphed into a pure product play. It's no longer challenging or stimulating, because it's too concerned with upsetting. It no longer shares a message, because it can't be sure the audience will be receptive to the message. It has become bland, empty content. Unfortunately with video games, the dominant trend is towards content. it's too easy to change what's in a game via a patch or update, and the dynamic between the players and the game developers means that there's now the expectation that creators will change things to suit the "fans." Don't like the ending of a game? Embark on a campaign to harass and terrify the developers into writing you a new ending (Mass Effect 3). Don't like that there isn't multiplayer in a game? "Petition" the developer until there is multiplayer, even if that comes at the expense of the thematic integrity of the game (No Man's Sky). If you look at game development, everything that's reasonably prominent is borrowing features from everything else to the point where it's getting hard to see any genuine identity in any of them. It's Borg-like assimilation. Everything's open world, and everything that's not is a "battle royale." Games-as-a-service is seen as a positive because it means unlimited content for "fans" so the never need to play anything else. Game development is about meeting a set of check-boxes, set by the expectations of "fans." And people wonder why I stick more and more to low budget stuff and "weird" games from Japan/ It's because only in those "indie" spaces that developers really have the room that they need to try things, and make something that some people won't like... and even in those spaces I hear nonsense like "listening to player feedback" far too often. The problem with including "fans" in the creative process is that if you have an idea that's even halfway intelligent, you can be sure that the critical mass of "fans" will veto that idea. You can't make an experimental game that's designed to make people dwell on the existential meaning of it all, because most people haven't got a clue what existentialism is, much less have read Sartre or Kierkegaard. You can't do something different, because if you do, there are going to inevitably be people that don't like that, and if your plan is to then listen to "feedback", those people are going to force you to water things down to suit them. Video games are the only art form that's open to be hijacked by the largely unthinking masses. The great thing about making a film or writing a book is that once the final product is out, it's incredibly difficult to change. You may well get a lot of criticism, but you're left with a stronger statement and work of art for it. If Rian Johnson was forced to "collaborate" in the making of Star Wars: The Last Jedi in the way that game developers need to listen to their "fans", then, yes, The Last Jedi may well have been less controversial.A bunch of "fans" that make the Comic Book Store guy from The Simpsons seem well-balanced by comparison would have been happier with the end result. But it also would have had less to say, and it would have been a far less interesting film. Game developers should patch bugs and flaws out of games when they're discovered. One of the great things about game development is that genuine flaws can be fixed post release, so if there's some kind of horrific crash bug, the game isn't ruined into perpetuity. That's a luxury that film directors and authors only have limited capacity for. But outside of that, game creatives should stop listening to what "fans" want when it comes to the ideas, gameplay, structure and narrative of their work. Most "fans" are not even remotely skilled in any creative field, and asking them for their opinions on creative decisions is like having a thousand people with no medical experience yelling at a surgeon and telling him how to do his job. I think it's important that the games industry remember that.